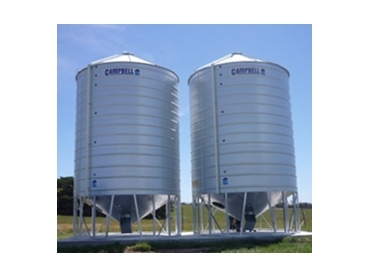 Supplier of silos and field bins, Campbell Silos offers standard and sealed silos that are available in sizes from 51 to 95 tonnes, however, silos can also be custom built to suit specific customers requirements. Standard and sealed silos feature a zinclume tank and roof and a galvanised base that has manhole for easy access. Additionally, to ensure that the auger can come in any direction, the lid lays flat on the roof of the silo. These silos also feature Maxilock bolts the tank for additional strength. To facilitate operation, standard and sealed silos have a grain chute with a 10:1 reduction, and self cleaning function that is actioned every time the lever is opened or closed. The hopper cam easily be removed and sight glasses are fitted on one side of the silo. Additional extras available with standard and sealed silos includes, air tight rubber seals on all openings, ground opening centrefill, and breather pipe pressure vent that is fitted to sealed silos to minimise air pressure build up that occurs with temperature changes.